After leaving Big Tree Camp, today’s trail meandered its way up and down and through a montane rainforest similar to what we had experienced on Day One’s hike. The morning temperatures were crisp, but we warmed up nicely once we got moving. Even so, we were surprised to discover a layer of frost on the leaves in the lower valleys. Eventually we ascended into the next ecozone, known as heather moorland. As the tall trees faded out of view, the trail yielded to a dense scrub of heather and protea bushes, and Kibo Peak and the Shira Plateau came into view. We crested a ridge just past midday and began our descent toward camp at Shira 1. 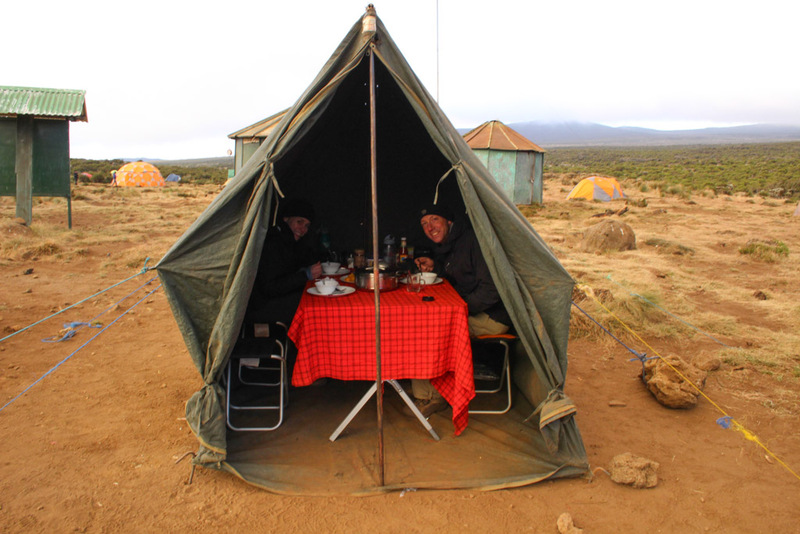 After washing up (a basin of hot water is provided at the end of each day for rinsing our face and hands as there are no showers on the trek), we spent the afternoon relaxing in the dining tent, playing cards and catching up on our journals. In the late afternoon Rashid took us for a brief 45 minute acclimatizing hike to stretch our legs, warm our bodies and give our lungs an opportunity to sample a higher altitude before the following day. “Hike high/camp low” is the operative phrase for successful trekking at higher elevations, and so we dutifully followed Rashid and Rama up the trail hoping we would be lucky enough to spot the odd elephant, buffalo or cheetah that might be encountered in this ecozone. Although we struck out on the wildlife front, we put our aim to the test in a friendly rock toss challenge and only were allowed to head back to camp once the cairn we had constructed in honor of the occasion had been demolished. As the sun went down, the skies cleared of clouds to reveal the imposing expanse of Kilimanjaro. The stars emerged on a scale that we never see in the light-polluted skies of Chicago, but with them came considerably colder temperatures imposing an early bedtime for us once again. 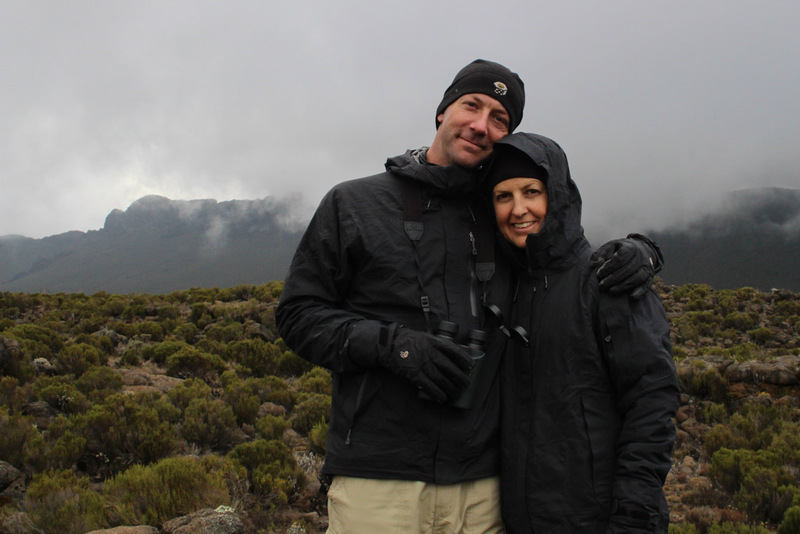 Great to see your images of Kilimanjaro and read your story. Thanks, Pamela. I very much enjoyed reading yours, too! Keep trudging along, you two. It won’t be long until you hit your next camp. I’m rooting you on just like they do on The Amazing Race. Come on, guys! You can do it! We appreciate your support, Andy. We’re not too many days from the top now!